Which Industries Qualify for the R&D Tax Credit? Home » Which Industries Qualify for the R&D Tax Credit? One of the major barriers for companies claiming the Research & Development (R&D) Tax Credit is self-censorship. However, it can often come as a surprise when businesses learn just how many different industries are in fact eligible for R&D credits. Ultimately, these federal and state tax credits offer a viable opportunity to transform R&D expenses (developing new or improved products, processes or software) to valuable R&D tax credits. Undeniably, a common misbelief surrounding the R&D tax credit is that only large corporations qualify and that it’s too complex to apply for. Although with recent changes to the R&D Tax credit, start-ups and small and medium-sized companies now have an unparalleled chance to profit from this lucrative credit. 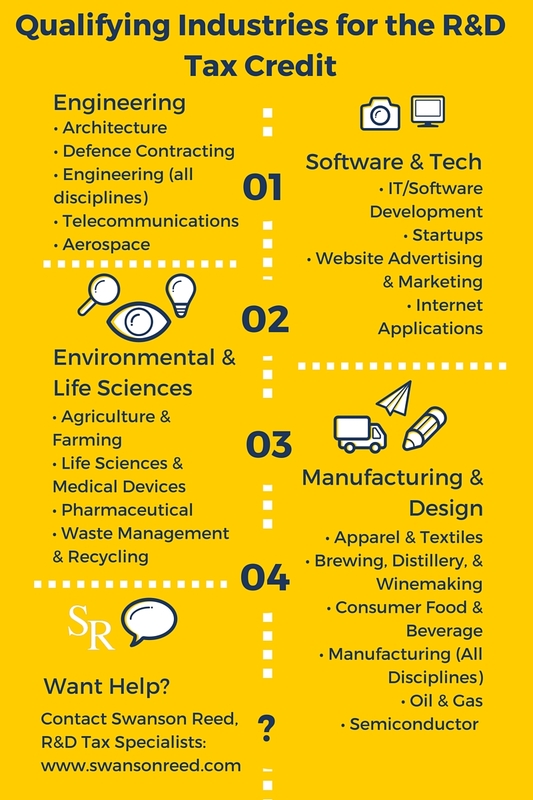 In light of this, we’ve put together an infographic which indicates which industries qualify for the R&D Tax Credit below. Alternatively, you can download the PDF to print or save here: Qualifying Industries for the R&D Tax Credit. Swanson Reed has a broad range of experience assisting a vast range of industries. Contact us today to learn more about the R&D Tax Credit and what your tax savings could be!